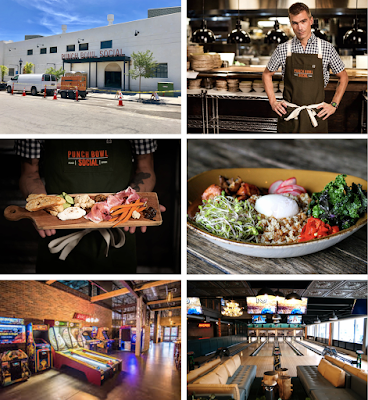 Almost two years in the making, Denver-based restaurant group Punch Bowl Social is nearly ready to unveil its 20,000 square foot "eatertainment" venue in San Diego's East Village, scheduled to grand open on June 9 with two levels of dining & entertainment space with multiple bars, arcade games, a bowling alley, and an eclectic menu from James Beard Award-winning celebrity chef Hugh Acheson. 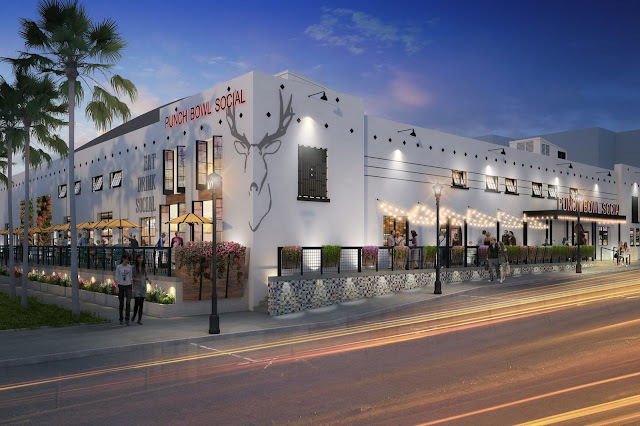 Punch Bowl Social is putting the final touches on its renovation of San Diego’s historic landmark 1920s boxing venue - the Coliseum Federal Athletic Club - located in the East Village directly across the street from the controversial 10 Barrel bar and restaurant. 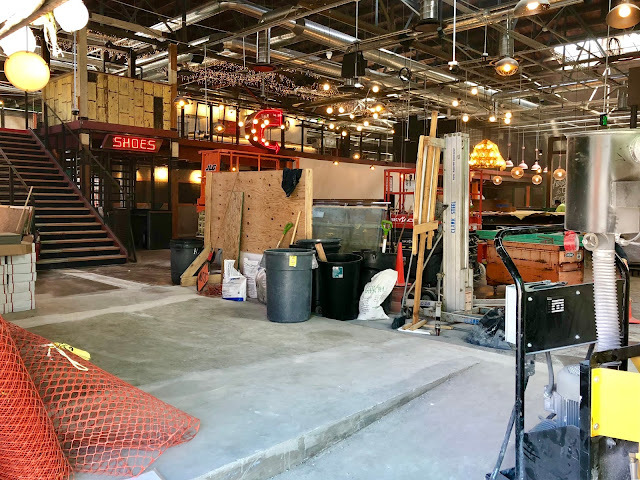 Once completed, the space will offer two stories of dining, drinking and entertainment space that will include a 150-seat bar & eatery with karaoke rooms, arcade games, ping pong tables, eight bowling alleys, dart boards, a bocce ball court and more. Punch Bowl Social will offer a diner-inspired, scratch-made menu designed by southern culinary sensation and celebrity chef Hugh Acheson. A frequent judge on Bravo's hit culinary competition Top Chef, Acheson has been named multiple times as the Best Chef Southeast by the prestigious James Beard Foundation, honored as Best New Chef by Food & Wine Magazine and is the author of the James Beard Foundation award winning cookbooks "A New Turn in The South: Southern Flavors Reinvented for Your Kitchen," "Pick a Pickle: 50 Recipes for Pickles, Relishes, and Fermented Snacks" and "The Broad Fork, Recipes for the Wide World of Vegetables and Fruits." He also serves as chef/partner of the Athens, Georgia restaurants 5&10, The National, the Atlanta restaurant Empire State South, and The Florence in Savannah, GA. The food menu at Punch Bowl will carry over some popular items from the brand’s other dozen-plus nationwide locations, including items like Hugh's Pimiento cheese with 'tender belly' bacon marmalade and Pullman toast, Maine lobster rolls with crème fraîche, and gluten free fried chicken. Heading the kitchen on a full time basis will be local chef Louis Laterza, who previously oversaw the culinary operations at Pisco Rotisserie & Cevicheria in Carlsbad. Punch Bowl will also serve a full bar with cocktails, booze infused punch bowls, and plenty of beer and wine options. The eatery will also serve weekend brunch. Conceived in 2012 by founder and CEO Robert Thompson, Punch Bowl Social has quickly gained national acclaim for transforming the dining and entertainment experience with an approach that focuses equally on food, beverages and games in a large-format, design forward environment. The company currently has locations in Denver, Detroit, Atlanta, Portland, Cleveland, Sacramento, Austin, Indianapolis, Mineapolis, Chicago, and Rancho Cucamonga, with at least another ten outposts in development. 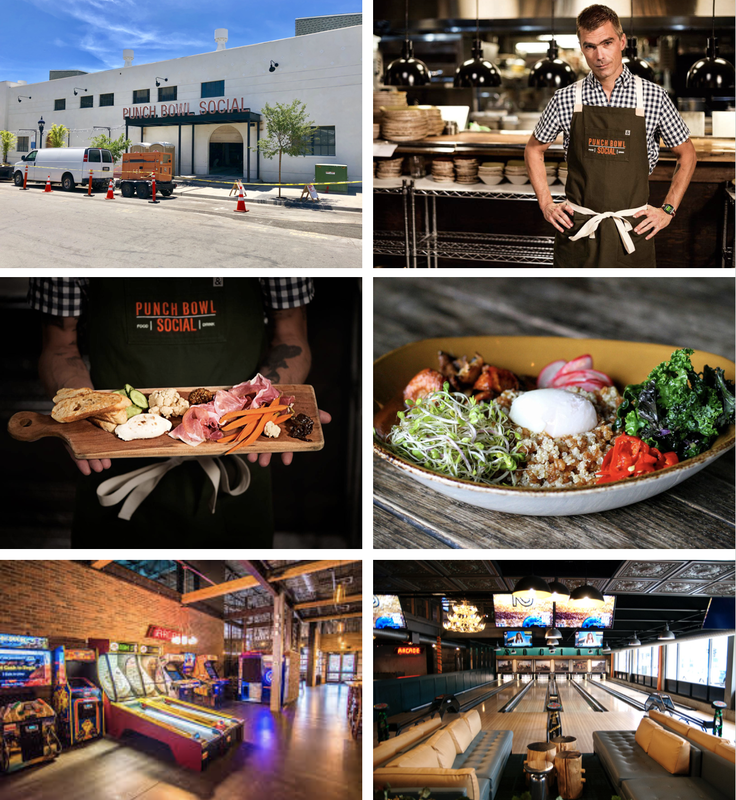 In addition to receiving dozens of awards since opening the first Punch Bowl Social in 2012, the company was named one of Nation’s Restaurant News’ “Top Ten Breakout Brands” in 2015. Punch Bowl Social is located at 1485 E Street in San Diego's East Village and will open to the public at 9pm on Saturday, June 9 following a ticketed party earlier in the evening to benefit the Emilio Nares Foundation. For more information, visit punchbowlsocial.com and check out the artistic renderings below.